It is possible, hundreds of cars go to Kel every year. My cousins went to Kel 3 years back on Honda City, and my friends went to Kel last year on Cuore. However its not recommended as track is quite rough from Sharda to Kel. But if you really want to go on car and you drive carefully and with patience then you can go for it as its just 19 or I guess 21 km from Sharda to Kel. Regarding accommodation, AJK tourism department resthouses costs around 2200 for a double bed room if I remember rightly. It was last year rate. Private hotels can range anywhere from 1000 to 5000. Valley tracker is best. And Kutton staff colony is best of all. By the way yara why don't you make a phone call to AJK tourism department muzaffarabad, to AJK hydro electric board and to valley tracker? You will have latest rates then. What is the plan for taobut? You can hire a jeep from Kel to Taobut or there is another option if you want to mange budget. That is, 4 or 5 "sawari jeeps" play daily between Kel and taobut. From 7 am to 2 pm. They takes just 200 to 300 per swaari (I don't know about latest rates). These are legendary FJ40 jeeps and are extended to accommodate 18 people. Ksi zmaanay mai kai bar I went to taobut on these. Again for latest rates, and specially for room availablity (because you are going in hell peak season) please make a phone call to them. Sir samjh gya mazrat. I am sorry, I think I was being unreasonable. How was your trip and how did you find Neelum Valley? Once upon a time I was badly in love with Neelum valley, actually been to Neelum valley 7 times and upper neelum (Kel to Taobut) and shountar valley are among my dream places. Acha how was your experience? I also missed many known places in kashmir which i hv plan to visit in my next trip. From where you will be departing? Lahore or Islamabad or what? And is there any infant or some old person traveling with you? Gujar khan, 60 km far Islamabad.. Better would be to try to reach Sharda as you have just 4 days. Leave early if you can, like after fajar prayer, 4 am. You should be in Muzaffarabad by 10 am. You can take brunch there and set off for Sharda. If you leave for Sharda around 12:00 pm then you can reach by sunset. Night Stay in Sharda. Leave early like 7 to 8 am and go to Kel. This 21 km can take 2 hours if you will go on your car. Drive slowly and with patience. Arrange a room in Kel, put your luggage and go to Arang Kel. It would be really difficult trek for small kids or some older person. So if you have parents with you then they can stay in hotel. Dedicate this whole day for Arang Kel. Arang Kel achi trah tassalli se phirnay vali jga hai it deserves a lot of time. Wander around here and there and try to reach forest on the right side of the Arang Kel which will come after crossing all the village and fields. Spend whole day here and spare just 1 and half hour for descending back to Kel before sunset. Night Stay in Kel. Leave from Kel for Keran or Upper Neelum (I mean Upper Neelum village which is situated at Keran, I am not talking about Upper Neelum valley which is Kel to Taobut). Don't leave early this day because after staying in Sharda and Kel, you may find it hotter in Keran these days. So try to reach there after the afternoon like 3,4 bjay. Night stay at Keran or Upper Neelum. I would prefer staying in Upper Neelum over Keran. You will have a wide view of the whole Keran area. You will see AJK on one side of the river and indian occupied Kashmir on the other side. Also weather would be bit colder in upper neelum. Spending last night in Keran will make you face less travel to get back to home. You can leave in morning aram se nashta kr k and you will be home inshaAllah by sunset. The only problem with above plan is that all three nights are in three different destinations. So a lot of packing unpacking, loading unloading etc. More the points/destinations to stay, more the hassle. To avoid this, you can even spend all three nights in Sharda and leave for home from Sharda on Day 4. But for that you will have to get back from Kel to Sharda on Day 2 after Arang Kel activity which will be tiresome for everyone and also you will need to manage time really tightly like leaving quite early from Sharda for Kel. But believe me, "staying at one place and day trips to other places" has its own advantages. It saves a lot of time and hassle. There can be many variations, like 1st night in Keran, 2nd in Kel and 3rd in Sharda. Or 1st night in Keran, second and third in Kel etc etc. You can do whatever suits you. Are you planning Taobut too? I would strongly advise AGAINST visiting Taobut in this short trip. Upper Neelum (Gurez) is not a place which can be visited in one day. Aaj kal many people do a day trip to Gurez like they hire a jeep from Kel, travel around 3 to 3.5 hours to Taobut, wahan kapra bicha kr roti khate hain and get back to Kel. Then they can say k wo Taobut ja chuke hain but its useless. Actually its not just Taobut, its a chain of beautiful villages of Sardari, Sonaar, Halmat, Karimabad, Nikron, Taobut and Taobut Bala. And most of them are heavenly beautiful if you get chance to really explore them. 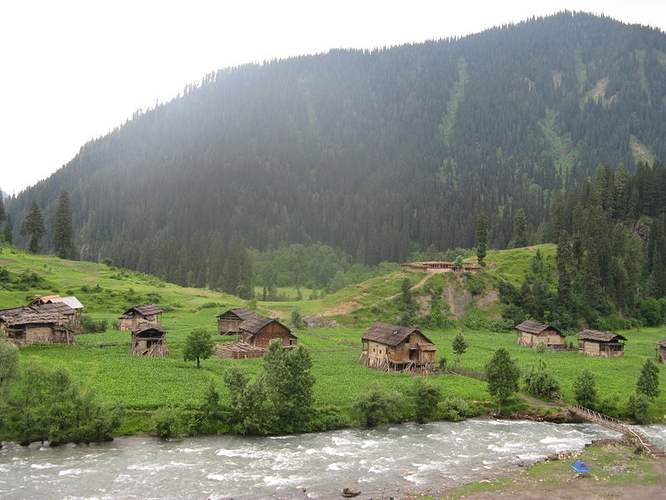 If somebody has 3 to 4 days just for Gurez and he is ready to trek a little then Upper Neelum valley is a wonderland. Otherwise day trip from Kel to Taobut and back to Kel or just spending one night in Taobut and getting back to Kel the next day is total waste of time. There are villages more rich in natural beauty than Taobut like Sonaar, Karimabad and Taobut Bala etc. But it demands time to explore these areas. More you explore more you will be in love with Upper Neelum. If you still want to go to Taobut in this trip then. Get up early in the morning and try to explore the villages I mentioned above as much as you can (but how can you :S ). And leave for Kel by 3 pm. But mere bhai again, please don't follow this plan. You are with family, why to do such commando action. Nobody will enjoy this much travel and just touching the places which demands quite a much time to be explored. Let it be first introductory trip to Neelum and Sharda and Arang Kel are more than enough for an introductory trip. I am sending my phone number in PM. Please let me know if I can be of any help. In eid holidays so I'm confusing... if i travel in first or second week of july is good ??? In that time what will weather ?? Yes indeed, only go in Eid Holidays if its the only option and you can not manage vacations other than Eid. You will face a hell of rush and crowd there in Eid Holidays. How long is Naran Bypass, 1.5 km or 2 km at max? Last year I was going to Astore via Kaghan road and It took me more than an hour to cross this just 1.5 to 2 km distance due to worst traffic jam. And worst of all is that it was just 6 am in the morning when I reached Naran. Subah subah 6 bje itna rush tha tu logon k jaagne k bad kitna ho ga. It was 3rd day of Eid-ul-Fitr. Babusar top tk jga jga yehi haal tha, around two hours to Batta Kundi mai lg gay. And during the same days a colleague of mine reached from Kalam to Behrain in whole day which is around 3 hours travel in normal days. Milti julti stories Neelum aur Galiyat ki bhi suni theen. Aur even Kumrat mai bhi rush tha. Natural greenery is one thing, actually they start cultivating land in april which turns fully green in July. Please check this picture. I took this shot in mid July 2009. This is Taobut. You can see my blue camp near bridge on the bank of Gagai Nullah. So July is the best time to visit. You will be stunned to see the beauty of Arang Kel in July. I know its hard to postpone the plan once you have make up your mind. But please get rid of Eid plan and wait couple of weeks because it worth that. And it would be good if you can add couple more days to your initial 4 days plan. I am not going anywhere on Eid, I normally leave after first week of July usually on 7th of July. I was just saying that no matter how you explain ppl that it will be hell crowded on Eid days, but still ppl travel on Eid days, so its better that some people make a trip during these holidays, so that rest of their life they convince others not to travel on eid holidays.